Exclusive to minder.org, actor Christopher Routh who played Shaun Barker in the #6.8 A Little Bit of Give & Take anti-drugs episode kindly agreed to talk to us about his time on the episode. We would very much like to thank Christopher for taking time out to talk to us. Q. How did you come to be involved in an anti-drugs episode of Minder and how were you chosen to play the role of Shaun? From what I can remember the Department of Health and Social Security (DHSS back then) were embarking on a 'Just say no campaign'. Remember Grange Hill and Zamo? Well that all happened around the same time. However, they wanted something that could be used in schools and I believe they approached various companies and in the end Minder was chosen as the perfect vehicle for this. I believe (although don't quote me on this) that both Dennis Waterman and George Cole gave their time for free. When I auditioned for the part I was a member of The Crucible Youth Theatre in Sheffield and went along to the audition knowing that they wanted a young boy of about 14 years old. I went along not expecting too much as I was 17 at the time. I know the production company auditioned many young actors from the north and they went to Leeds, Manchester, Sheffield and perhaps one or two other places. I had to go to another audition in London and meet with some other young hopefuls. In the end it came down to me and my friend and in the end I think they chose me because it would mean that during the filming I wouldn't need a chaperone as I was over 16. It was quite a nerve-racking experience as I'd never acted on camera before and here I was all of a sudden thrown in at the deep end acting with Dennis Waterman and George Cole. Q. What was it like working with George Cole, Dennis Waterman & Glynn Edwards? As I was new to the game I think the producers decided to break me in slowly. I remember the first days of filming were done with me and the other 'youths' in the script, so we did things like the opening scene with me arriving at the flat. Here I met Elaine Lordan for the first time - she had been acting professionally for a few years and was much more experienced than I was. Then we filmed the party scenes where all I could think about was meeting all these faces that I'd seen on TV in Grange Hill (look in the background and there's one or two familiar names there). 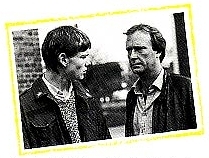 I think towards the end of the week (the whole thing took 8 days to shoot) I met Dennis Waterman for the first time and we shot the scenes in the boxing club and approaching the boxing club. What amazed me about Dennis Waterman was the fact that he could learn his lines so quickly. I had had the privilege of being allowed into his trailer to meet him and I sat down with him to read through the scenes with him. Also what was fascinating was the way he subtly changed the lines, as he had a far better idea of what Terry might say than the script writer! And that was it - he knew his lines. I'd been up half the night trying to learn mine and he learnt them in one read-through! Dennis was very patient with me although there was the odd jibe about me from being up North and he loved to joke and banter with the film crew (who all knew him and respected him very much - most of the crew had worked with Dennis before as they were mostly from Euston Films). At lunch time he liked to go off to the pub and have a couple of beers - he is definitely one of the lads with absolutely no airs and graces whatsoever - but he'd be back after lunch ready to go. My favourite scene in the episode is the one between Dennis and me in the car. I think this had been my third day with him and I felt much more relaxed and I think it shows in the performance - it translates that Shaun is much more at ease with Terry and has come to respect him - but really that was the way I felt about Dennis; I wasn't consciously aware of it at the time. I only worked with George Cole for about 1 day in total. For me the thrill was going to the Winchester Club and being at that famous bar! (which of course was a studio set). George Cole is a more 'gentlemanly' actor; that is to say he was very polite, very quiet and to be honest we really didn't have the time to get to know one another. One incident I remember is the director telling me that when I was acting with Glynn Edwards (Dave) I had to speak up as he was slightly deaf. Whether this was true or not I don't know, but you do notice in certain episodes that Glynn Edwards has to lean over the bar to get what the other actor is saying. I was amazed at the way George Cole could interpret a scene and make the lines instantly comic and know where the cuts would be made. You have to appreciate that at the time, this was all new to me. Q. Is there anything in particular you can remember about filming the episode? It was filmed I think I'm right in saying at the end of 1985. I was at college at the time and had to take a week off that to do it. Filming was done in 8 days - 7 days initially and then one extra day a couple of weeks later. Most of the episode is with me and all the other young London actors. Elaine Lordan was much more experienced than anyone I believe, and it showed in the way she could instantly lift the script off the page where as I needed a bit more coaching from the director, Chris Menaul. I remember one incident that annoyed everybody. As I was not familiar with London one morning I took a taxi to a street with the same name as the street I was meant to be going to and ended up being about an hour late having gone to a location that was the other side of London! There was no such thing as a mobile phone back then. When I arrived the producer was not best pleased and all the crew gave me some dirty looks as no filming could take place without me. I also remember that the Capri used in this particular episode is not the Capri that the company normally used. The producer rented the car off a woman for about £100 for the day. You don't see much of it in the episode (deliberate) but if you look carefully, the damn thing was knackered - not the Capri Terry would drive. Q. When asked about this difficult to track down episode, George Cole said he can barely remember filming it - any reasons why? I'm not surprised that George Cole has difficulty remembering filming it as he worked on the shoot for literally one day I believe. 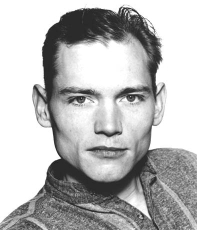 His availability was tight which is why one crucial scene between him and Dennis Waterman was changed to a telephone conversation. (Hot Pots) Originally that conversation was to have taken place with the two of them together but it couldn't be arranged for them to be able to do together so they simply recorded their exchange separately and then the producers stitched this together again post-production. Q. How do you feel about the fact that many Minder fans were only able to see this episode in school and the fact now it has become very difficult to track down? Of course it's a shame that it's never been shown on TV. I was hoping that it might make it into the schedules but alas it's only 30 minutes and not the full hour. To be honest with you I don't think Euston Films would ever allow it to be broadcast because they would pick holes in its production values - it was quite cheaply made, made quickly and for a different purpose. It's purpose was as an educational tool, not a fully-fledged episode of the legendary Minder. When the final product was released there was a bit of a premiere at my college in Sheffield with one in London for the Secretary of State for the DHSS (I forget his name now). I was interviewed by the press about my opinion on drug taking and whether I thought this project might benefit young people. To be honest I didn't have a clue. To Minder aficionados it must be frustrating not to be able to see this episode - it was after all one of the very last times George Cole and Dennis Waterman worked together although I do believe they did one other special after this (you'll probably know more about that than me). About 4 years ago I was directing a small cabaret on the London fringe with some actors who also have day jobs and one actor told me he knew me from somewhere but couldn't remember where from. One day it clicked and the following day he brought me the booklet that accompanies the video. His day job? Schoolteacher. He said he'd bung on the video if he couldn't think of anything else to do. I still have the booklet (which includes the full transcript of the episode) to this day. Q. Were you a Minder fan too? Of course I was a fan of Minder! It was part of my staple diet of TV when I was a teenager. I was also a big fan of The Sweeney. I did follow it up to the end with Gary Webster taking over although for sentimental reasons I preferred it when Dennis Waterman was the man. He's a tough act to follow but I think Gary Webster did the job very well, but somehow it was the relationship between Waterman and Cole that was the spark. Q. Where else can we see you in action and what current projects are you working on? What are you involved in when you are not acting? The easiest answer here is look up Christopher Routh at imdb.com - I played a Russian submariner in a film called K-19 The Widowmaker. I have a small but significant role in that film - working with Harrison Ford and Liam Neeson. I've also been in a couple of religious epics for NBC television - Mary Mother of Jesus where I play John the Baptist and In the Beginning where I play an Egyptian alongside Christopher Lee. After the Minder experience I went back to college, finished my A'Levels and went to University in 1986. After that I went to drama school here in London and to be honest with you, I've had a difficult time carving out a career. It's been very sporadic and at the moment I'm temping here in London. I'm currently working at Great Ormond Street Hospital in their fundraising department. I've also directed some plays here in London on the fringe and I was co-founder of a theatre company called The Permanent Transients. Alas we are no more. However, I'm still hopeful and I still send my CV off to casting directors and theatres hoping for a job!